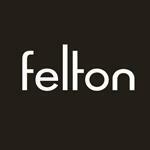 We aim to give you a better insight into Felton's core values, company culture and the people that make it happen. The charm of traditional, old-world tapware with a clean and contemporary finish. The Indi range of tapware teams sleek styling with a solid brass construction and German headworks.